The v5.5 beta update brings more balance improvements and bug fixes to the game. Update to SK Stronghold graphics and SK Fortress. Tons of new and updated icons for items, units, and improvements. Update to some of the Kingdom tactical maps assets (particles, non-traversable area texture, and rock props). Update to Swamp City tactical battle map layout. Update to SK Stronghold tactical maps (added 3 more new ones). Update to the Armageddon (shadow world portal) tile design graphics. Tile design for swamp forest tactical maps. Art assets for Kingdom Monster Lair tactical battles. Added particle effects to Kingdom tactical maps. Created new Dungeon tactical maps. Added wolf bite animation, and all rival pioneers. Added Rival pioneer mule textures. Skin, Primary, and Secondary materials now have their own skymap. Specular intensity raised on Primary and Secondary. Toolbox button on Title Window changed visually, and location is lower left. Adding enchanted versions of lots of items. All items that aren't quest items or consumables should be enchantable. New item: "Essence Scroll" that adds +1 essence slot to one of your cities. Several new Rare recipes added to the game. SK higher level armies have fewer super tough monsters and more darklings (fodder). Rival faction units grow to their calculated size slowly instead of instantly. Doomsday reduction from killing a LT increased from 10 to 50. Added -25 Doomsday reward on alliance with a Rival Faction. SK monster QUANTITY isn't affected as much by world conditions as it was before (before it would quadruple, now it increases by less than 2X, the quality of the units remains lethally the same as the doomsday counter goes up). Add a "Rush" ability to all mounted units (friendly and enemy). The minor move increase they currently have over champions limited their uniqueness in tactical. 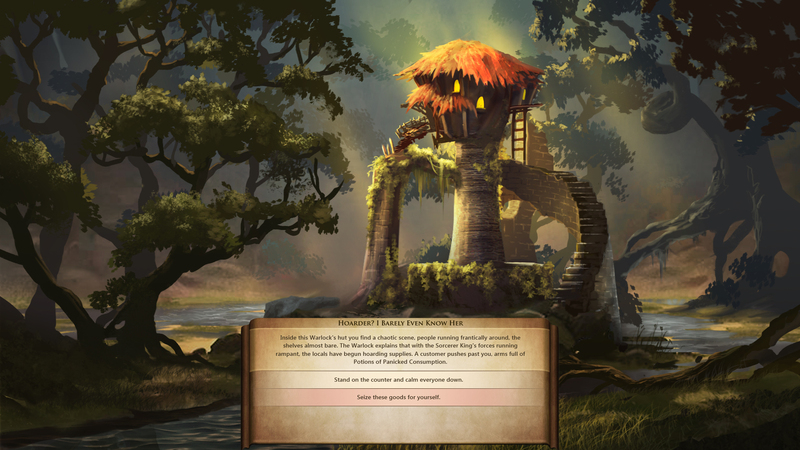 Player starts with the ability to cast two sovereign spells instead of one. Summon ice elemental requires minimum of 100 lore to be spent, costs 15 mana. Armageddon spells change such that the player gets to control the demon group that comes out. Transmutation spell now has a description pop-up of the item that just got made. # of shards no longer increase linearly with map size. Most of the shard count will be determined by the shards option in game setup. Minor race trading with you no longer sets the last contact time so that the player can still contact the minor race. Added a fix for a loophole where you could get a conversation with a Minor Faction before having the "first contact" conversation. Text tweaks to description of Drogon and Napahaz. Tweaked text to remove confusing references to "recruited champions." Updated descriptions of the rival factions. Changed end game score calculation. Healing Light formatted text fixed. Guardian's "Volcanic Vengeance" ability now unlocks the Volcano spell. Fixed 'Flaming Arrow' range issue and missing icon. Shale Strike icon hooked up. Transmutation Sovereign Ability description re-written. Fixed the Dwarf Hero's axe in his left hand. Units stationed in a city, or subunits of an army, now have disabled actions for actions that have no effect in those cases (guard, explore, pass). Changed text for dialog box that comes up when Auto Explore is automatically cancelled due to having no more FOW to clear. Revised text of Galor-SK Trading quest (Threat Level 0 Interaction). Lieutenant Placement: added check for spots that are a bit further from the player. This fixes issues where the Lieutenants would be creeping about in your starting area. Display HP loss or gain as a quest reward Quest Complete Window. Some quests do this, but it was not being displayed. Customize Sovereign window controls are now pre-populated with information from the Sov passed in, so that you can edit what was already set, rather than having to start over every time. Replaced Archer Increased Range bonus with a free Archer unit for one of the random quests. Fixed crash due to running out of suitable starting locations in a tactical battle. New art assets for the Rival factions settled cities. Tweaked text to make the number of souls less specific so it doesn't imply any changes to population levels. Sovereign - Updated Sovereign Descriptions to make sure gameplay differences are explained. Game does a better job of placing the player on tiles with food yields when no starting points are available. Beaches now take the surrounding tiles into account when determining what kind of beach they should be. Revised Dungeon maps (and others that use dungeon secondary locations) to use a variety of different dungeon tactical maps. If the SK hasn't contacted you by turn 5, he will contact you. No matter what you do, if you have more than 3 cities your Sk threat level will be at least 3. That's a real beaut of a changelog Clark!